It is very important to understant the concept of the Citrix XenApp Login Process so that we can troubleshoot our Citrix Farm whenever there is an issue to it. 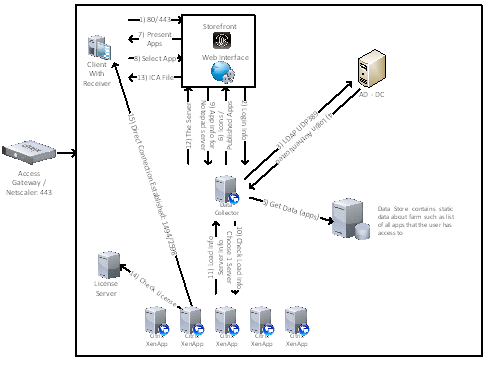 Below is a simple diagram showing step by step how the Citrix XenApp Login process takes place. The client device with Citrix Receiver (ICA Client) connects to the WI or Storefront via port 80 (HTTP) or 443 (HTTPS). WI or Storefront sends login credentials to the Data Collector. Data Collector passes along the credentials to the Domain Controller via UDP389 (LDAP). Domain Controller authenticates the client and passes the authenticated acknowledgement back to the Data Collector. The Data Collector queries data from the Data Store to determine what applications the user has access to. Data Collector sends the icons of the allowed apps back to the WI or Storefront. WI or Storefront presents the apps to the client. The client selects the application to run, for example, NotePad. WI or Storefront gets application information for NotePad server through Data Collector. Data Collector checks the load information and choose one best server (based on load) in the farm with the NotePad app. The Load info is now sent back to the Data Collector by the XenApp Server farm. Data Collector presents the appropriate XenApp server to the WI or Storefront. WI or Storefront sends the information to the client via an ICA file. The XenApp Server also check Licensing information from License Server. The client now can establish a direct connection to the chosen XenApp server through port 1494 (default Citrix ICA) or port 2598 (Session Reliability). Note: the above describes a client connects to the Citrix XenApp Server inside the LAN environment. For external users, the connection is done via Access Gateway or Netscaler on port 443. Web Interface is more for Windows Desktop. This is more likely the case but it is not exclusively the case.